Aurora, OH: Network Technologies Inc (NTI) today announced the addition of the GSM Automatic Voice Dialer to its popular line of alert and communication sensors that are compatible with the ENVIROMUX-2D/5D/16D Enterprise Environment Monitoring Systems and the ENVIROMUX-MINI-LXO Mini Environment Monitoring System. The ENVIROMUX-AVDS-GSM(-P) calls or sends SMS messages to up to 8 telephone or cell phone numbers when a sensor goes out of range of a configurable threshold for prompt responses to emergencies. Ideal for remote places without conventional phone lines, the GSM automatic voice dialer ensures personnel are notified when problems occur. The dialer features one input channel that can be programmed for activation, and can store one outgoing voice message of up to 20 seconds and one SMS message of up to 70 bytes. Compatible with normally closed or normally open circuit connections, the dialer has a maximum power consumption of 12VDC @ 250mA. 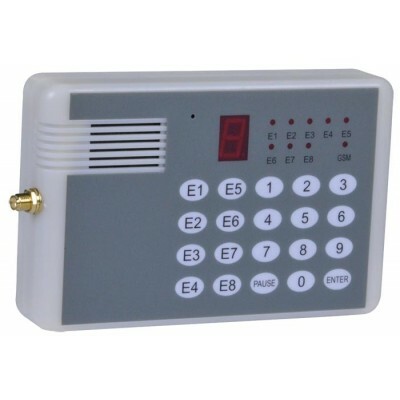 The ENVIROMUX-2D/5D/16D or ENVIROMUX-MINI-LXO sends a signal via its output relay connection to the dialer when an alarm is triggered, and the dialer will then call or send an SMS to the programmed numbers. The ENVIROMUX-2D/5D/16D can power the ENVIROMUX-AVDS-GSM using the digital terminals. The ENVIROMUX-AVDS-GSM-P is compatible with the ENVIROMUX-MINI-LXO and comes with an external 12VDC power supply for the dialer. Available for immediate sale, the ENVIROMUX-AVDS-GSM costs $210 and the ENVIROMUX-AVDS-GSM-P costs $222.